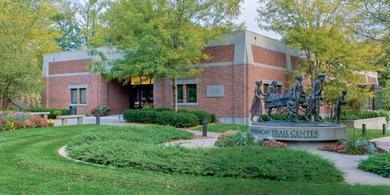 The Mormon Trail Center at Historic Winter Quarters, located in Omaha, Nebraska, is a visitors’ center with exhibits about Winter Quarters, a major settlement for Latter-day Saint pioneers after they left Nauvoo, Illinois. 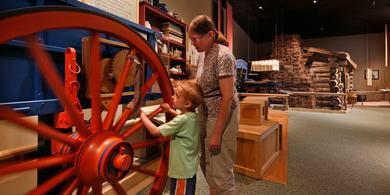 The exhibits describe the Latter-day Saints’ westward migration to the Salt Lake Valley in Utah by wagon, handcart, sailing ship, and train. Next to the trail center are the Mormon Pioneer Cemetery and the Winter Quarters Nebraska Temple. The Mormon Pioneer Cemetery, which was a burial site for some of the pioneers who died at Winter Quarters, includes a monument called Tragedy of Winter Quarters, sculpted by Avard Fairbanks. For information about visiting these places, click or tap here. Winter Quarters was one of as many as 90 Latter-day Saint settlements along the Missouri River in Nebraska and Iowa. Although the settlements were temporary homes on the way to the Salt Lake Valley, many Saints worked and built as if they would stay there for decades. They established successful farms and businesses and even published a newspaper. Brigham Young and other Church leaders spent time at Winter Quarters, ministering to the Saints and helping them prepare to travel west. While there, Brigham received a revelation that helped the Saints organize themselves and prepare spiritually for the trek. That revelation became Doctrine and Covenants 136.